We are all so proud of you. There are three monsters who see you as their hero. There is no one better. I like you, too. Are you using a custom spreadsheet, or some program for tracking your stats? oh, also congrats on elevating to a real domain! Awesome. I love the graphs. There isn't a lot that is more satisfying during the training than looking at various graphs. 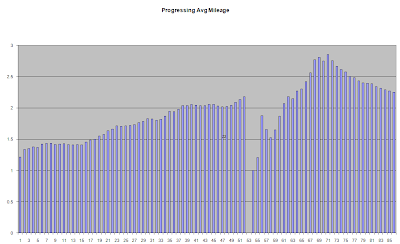 Seeing the consistency and the sheer volume of cumulative running. I definitely think that it is fun. 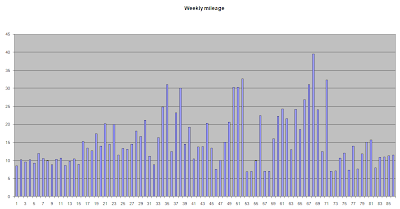 Especially when the long run distance keeps increasing, and the graphs have to get larger to accommodate it. Thanks again. The little guy is out on the track, getting some 400's in right now. I told him not to come home until he got at least 12 in at his 5k pace. Being a week old now, his endurance is really improving. @Moriah - You leave the best comments ever. @Tom - I put the stinkin' ANAME records in like three times now! argh.